The important art collection of the Fondazione Cassa di Risparmio di Perugia is housed in Palazzo Baldeschi Cennini. ✴a panel of the Assumption of the Virgin with SS Thomas and Sebastian, which could have come from the chapel in San Benedetto, Gualdo Tadino that was dedicated to St Thomas in 1488. The provenance of this panel, which is attributed to Perugino, is unknown before 1847, when it belonged to Colonel George Lindsay Holford in London. The foundation bought it in1987. The panel depicts the Madonna and Child enthroned with two cherubs: the central figures are based on those of Perugino’s Decemviri Altarpiece (1495-6). This panel, which is attributed to Nicolò di Liberatore, l' Alunno and Lattanzio di Nicolò, might be the Pietà from San Bartolomeo di Marano that is mentioned in the will of the latter. It depicts the dead Christ on his sarcophagus with the Virgin and SS Francis, John the Evangelist and Mary Magdalen and two other female saints. This panel, which has been cut down at the sides, is dated by inscription but is of unknown provenance. The arms next to the inscription seem to be those of the Zuccari family, and the work is attributed to Federico Zuccari. It depicts St Catherine standing next to the broken wheel upon which she was supposed to have been martyred. A number of her persecutors have been wounded by the miraculous destruction of the wheel, while others flee in terror. 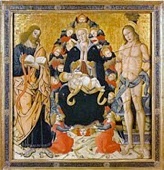 Giovanni Baglione records in his autobiography that Cardinal Gaspare Borgia commissioned this altarpiece for his chapel in the Chiesa della Madonna di San Giovannino, Rome. It entered the collection in 1999. 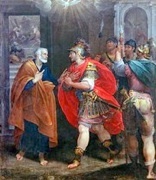 ✴St Peter converting the centurion Cornelius. This panel, which seems to have been painted in Naples, is attributed to Ippolito Borghesi. It entered the collection in 1998 and was restored shortly thereafter. This small panel, which is of unknown provenance, is attributed to Vincenzo Pellegrini. •an angel instructs her to return. ✴the satyr Marsyas challenging Apollo to a musical contest, a presumption that will lead to his flaying and death (illustrated here). 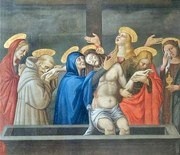 This panel is attributed to Andrea Camassei. This panel, which is of unknown provenance, is attributed to Pietro Montanini. ✴Delilah arranging the cutting of Samson’s hair. This panel, which is signed by Etienne Parrocel and dated by inscription, depicts a woman who represents the New Testament repelling heretics. This sketch in oil, which is signed by Jean Baptiste Wicar, depicts Roman charity (a story told by ancient Roman authors in which Xanthippe fed her father Mycon with her own milk when his gaolers forbade him food). The associated final panel was apparently submitted by Wicar to the Accademia di San Luca in 1803 to support his application for membership. It has since disappeared. 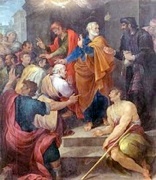 The sketch, which was still in Wicar’s studio in Rome when he died in 1834, passed into a private collection and was bought by the Foundation in 2003. This sketch in oil by Jean Baptiste Wicar was made in preparation for his last work, the altarpiece (1826-35) of the Baptism of Christ for the Duomo, Foligno (above). The work was protracted: the sketch and the incomplete panel were still in Wicar’s studio in Rome when he died in 1834. His pupil, Decio Trabalza completed the panel, and it is still in the Duomo. The sketch, which passed into a private collection, was bought by the Foundation in 2003. This panel is attributed to Napoleone Verga. Return to Palazzo Baldeschi Cennini.